Heat oven to 350 degrees F. Coat a 9-inch cake pan with cooking spray. In a large mixing bowl, using a mixer on medium speed, beat oil, sugar, vanilla, milk, cocoa powder, baking powder, baking soda and salt until well combined - about 2 minutes. Reduce mixer speed to low and beat in flour until just combined. 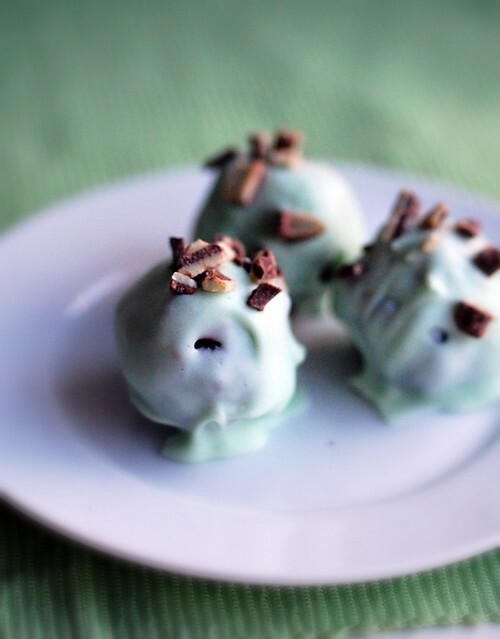 Pour batter into pan and sprinkle 1/3 cup Andes mints on top; bake 20-25 minutes or until set and no longer wobbly. (No eggs so you don't have to worry about it being done.) Cool brownie until cool enough to handle. Well cool, take spoonfuls of brownie and roll into balls. Melt the almond bark in a medium bowl until melted. Stir in a little green food coloring if desired. 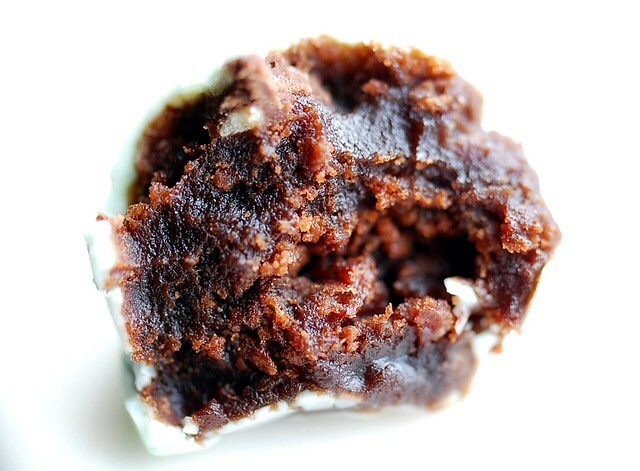 Dip brownie balls into almond bark and set on waxed paper to dry. Sprinkle additional Andes mints on top if desired. 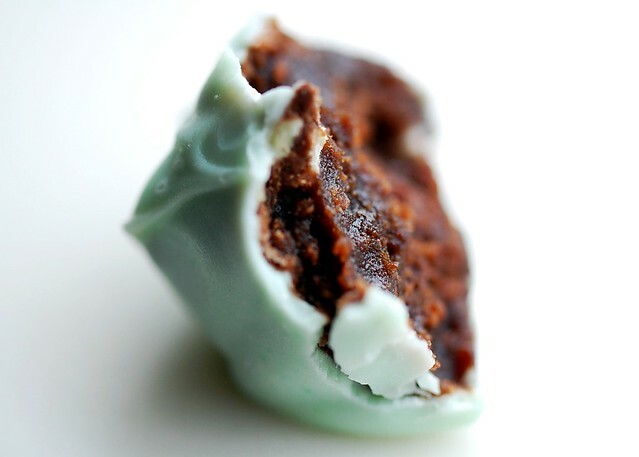 28 comments on "Andes Mint Brownie Truffles"
delicious! Have a wonderful Christmas with your family! Oh my, I'm a sucker for anything minty and chocolaty! Those look fantastic Emily! i am SO making these. merry christmas, emily! Beautiful truffles. I particularly like the second photo with the bite taken out of the truffle. The shallow focus and soft lighting make it look ethereal. Really lovely. Great truffle flavor! Merry Christmas Emily! Ooo, I want these! They sound easy to make, too. And your photos are gorgeous! Those look so gooey and moist inside!!! I would LOVE to have one of those right about now. 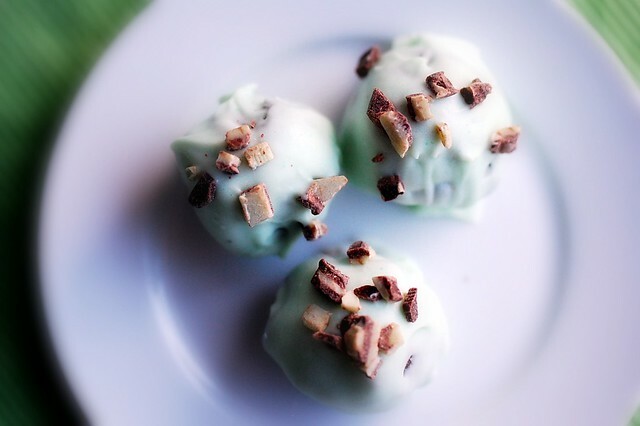 Ooo truffles are my weakness--I may have to make this for St.Patrick's day!! Have a wonderful Christmas! IHave a wonderful Crhistmas too. These looks delicious! Merry Christmas, Em. I know it will be a great Christmas and I can't wait to hear all about it. 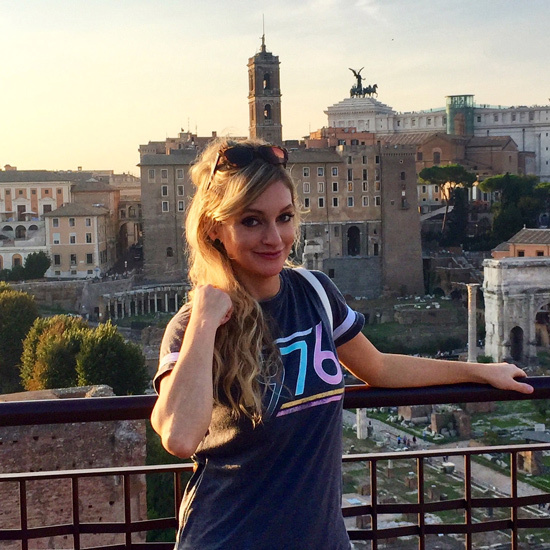 Your blog just keeps getting better and better. Keep up the good work and I know 2011 will be a great year for you and Eric. Emily, these truffles sound phenomenal! 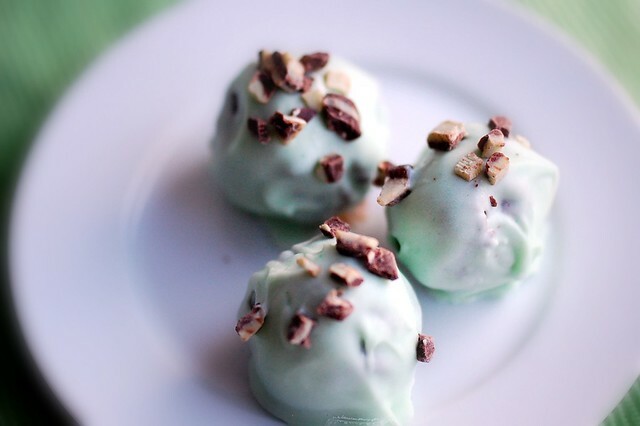 I'm all about mint & chocolate lately, and these would perfectly satiate my craving :). Happy Holidays! Merry Christmas Eve, dear Em! I've cut brownies out with small fluted round cookie cutters, but I've never rolled them into balls. How cool! Yummy. I love that you don't quite have your menu together (or that you didn't as of yesterday). Now I don't feel so bad. Those look wonderful. Congrats for getting on Tastespotting! Merry Christmas! Wonderful truffles!!! Have a great Christmas Emily!!! oh yum, wish i was santy claus!! merry christmas! Merry Christmas! I hope you and yours have a wonderful and delicious holiday! All I want for Christmas is...these. Wait, I think Christmas is over so I think I should just rewind. Yum!! I hope you had a great Christmas. these look wonderful! have a wonderful Christmas, emily! ps- i had some of your sugar cookies, they were awesome!! I love Andes mints! These truffles are totally right up my alley! Thanks everyone! You guys are so sweet!